You’ve probably never heard of National Waffle Day, but this silly little holiday comes around every year on August 24th. If you’re a lover of breakfast foods (or desserts! ), you know Jersey City has great spots for both. Lenox residents can celebrate at a few restaurants known for this delicious sweet battered treat, without even having to leave our neighborhood! The Kitchen Step – While their specialty may not be waffles, The Kitchen Step offers a delicious fried chicken option over a buttery waffle. Their chicken has a kick from their homemade honey-sriracha glaze but then they top it off with grass-fed buttermilk gravy. While only a 10 minute walk away from Lenox, you’ll be glad you walked after this delicious meal! The Kitchen Step has a full bar with a fantastic brunch cocktail list as well. One of our favorite drinks there is the Pina Colada. It will pair perfectly with your waffle on beautiful Sunday. Brownstone Diner & Pancake Factory – If you’re looking for the number one spot in Jersey City to go to for waffles, Brownstone Diner is it. It also happens to be the closest to Lenox! This restaurant has every type of waffle you could dream of. Whether you’re looking for something sweet like a Belgium waffle with strawberries or a dinner of fried chicken and waffles, you’ll find it here! 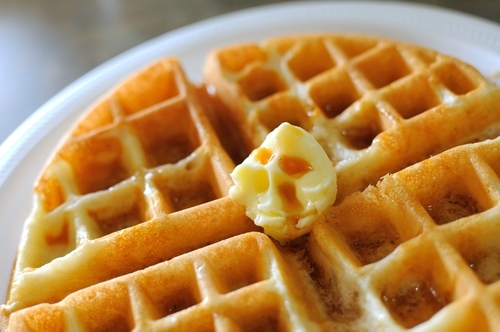 We love Brownstone because like most diners, they serve waffles all day!